Inspired by London’s enrapturing street art scene of the 1990s, Zombiedan has used his childhood experiences in the capital to become one of the most exciting urban artists today. His work is best described as graffiti art, using intricately cut stencils layered over seemingly vandalised backgrounds. Each work is infused with vivacious energy and colour that makes his work stand out in his medium. Although Zombiedan’s greatest muse is the street art he encountered in his youth, there are undeniable influences of pop art in his work. 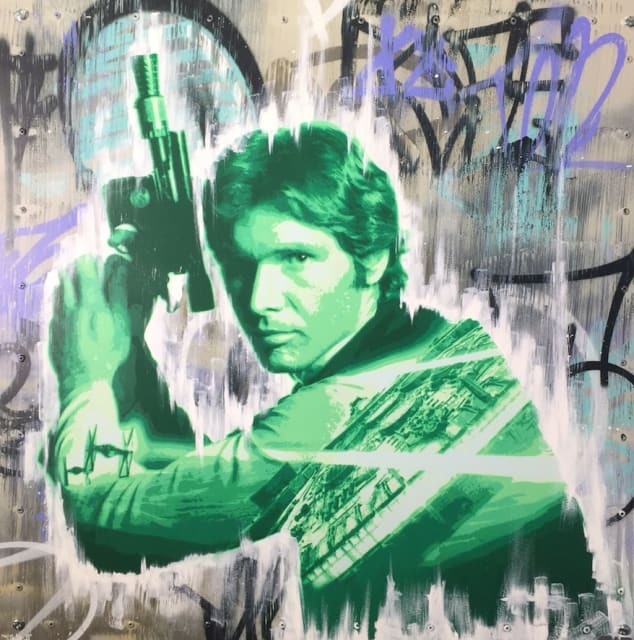 His unique stencils, often cut in the shape of iconic celebrities or objects from popular culture, give an alternative edge to the pop styles seen before. Browse our collection and buy original Zombiedan artworks for sale here. Zombiedan was born in 1990 in Stockwell, London, witness to the golden era of the capital's underground urban and street art scene. Consumed by the city’s captivating culture of creativity, he showed a keen interest in art from an early age and excelled in the subject at school. At the age of 14 he relocated to Boston, a small town in Lincolnshire where street art was largely a foreign concept. Nonetheless, his distinct urban artistic style earned him plaudits and he left school with a double distinction in Art. Reviving a passion for street styles, he took to graffiti art and cites Banksy's documentary film ‘Exit Through the Gift Shop’ as an early inspiration. As he set about mirroring the modern day influences of Banksy and another street artist, Blek Le Rat, he familiarised himself with the technique of creating stencils and began his first works, building up layer after layer of spray paint to create his trademark vandalise effect. Mid-2014 saw Zombiedan take to the streets of Boston as an anonymous street artist, spray paint in hand, on a campaign to promote urban art. His work earned him plenty of local attention, most of which was highly approving. A particular work featuring a depiction of King Kong climbing St Botolph's Church was cited among the best to feature during the campaign. Realising he needed to put a name to his work, he began to use the pseudonym Zombiedan, a nickname first coined by a local tattooist to help him recall which Daniel he was. Among many quirky tattoos, he has the image of a zombified nurse on his forearm, hence the name. Media attention began to surround Zombiedan and he soon received invitations to exhibit his works at the likes of ComicCon and Upfest in 2016, Europe’s largest street art and graffiti festival held in Bristol each year. It was at Upfest where Zombiedan gained an explosive cult social media following, as well as offers from galleries across the country hoping to represent his talent. Now a revered commissions artist and still very much active on the street scene, Zombiedan's truest skill comes from his ability to remove the common limits of graffiti artists to create works that traverse the boundary between urban and fine art. "My biggest obstacle in life was not knowing what I wanted...then I picked up a spray-can".